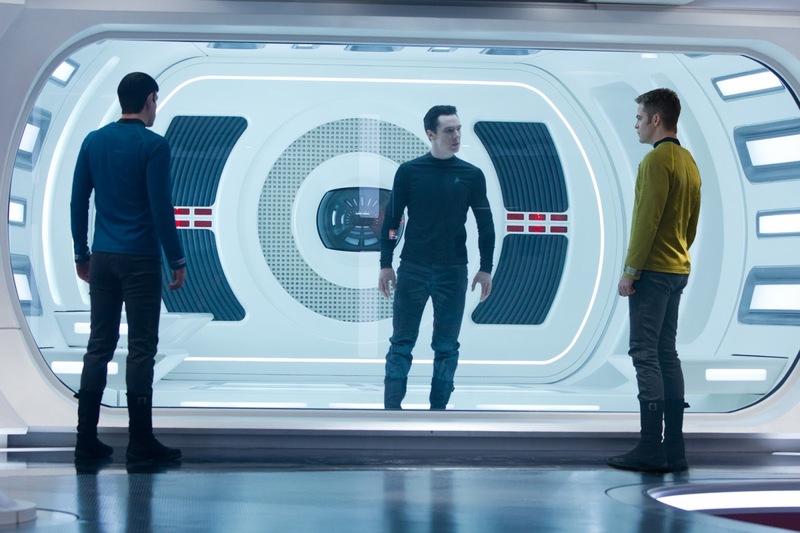 Zachary Quinto as Spock, Benedict Cumberbatch as John Harrison, and Chris Pine as Kirk. I was surprised at how much I enjoyed J J Abrams' STAR TREK reboot, never having watched any of the various iterations of the TV shows. It had real youthful energy, genuine camaraderie, and a cast that definitely outperformed expectations (Chris Pine, I'm looking at you!) Add to that one of the few time travel/parallel universe storylines that actually makes logical sense, and I was totally sold. J J Abrams' sequel unites the original crew in front of and behind the camera, with the exception of adding writer Damon Lindelof, who managed to piss off most TV sci-fi fans with LOST and really messed up the reboot of ALIEN. The good news is that his hand is not notable in this movie - the story is logical, involving, asks profound questions, and yet has a wonderful light comic touch. I particularly love the fact that even small characters that we forget about - like Chekhov (Anton Yelchin) - end up playing a critical and plausible role. The additions in front of the lens - Benedict Cumberbatch as the new villain John Harrison, and Alice Eve as a new crewmember - both work out really well too. Add to that the same sleek visuals, intelligent script and beautiful score, and I'm struggling to work out why, while I had a good time watching this flick, I left the cinema feeling somewhat underwhelmed. Anyways, back to the plot. The movie opens with Spock on Mordor sacrificing himself for the greater good of the planet and his crew, resulting in Kirk doing the human gut instinct thing and rescuing him, exposing a comically pre-civ planet to awesome tech, and getting kicked off Enterprise by an irate Starfleet as a result. 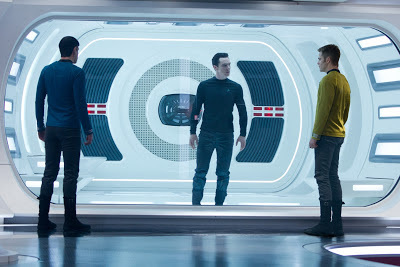 This then brings us to the setup of the movie proper, in which a nasty evil vengeful terrorist (Cumberbatch) manipulates a desperate father (Noel Clarke) into launching an attack on Starfleet. What I love about that scene is that it plays almost entirely without dialogue - and while Clarke has a small cameo role, the acting that he does without words is exceptionally strong. All these machinations lead to the Enterprise being sent to the Klingon home planet to assassinate Harrison, armed with deadly secret Starfleet weaponry, that raises all sorts of moral questions about assassination without trial, and the use of deadly weapons in a pre-emptive strike. Whether you think the writers were heavy-handed in tackling these is a matter of taste: I rather liked it, but even I felt it was quite jarringly clear that they were basically making out Harrison to be Al Qaeda/Black Spiderman, the Klingons as the Taliban, Kronos as Afghanistan, Admiral Marcus as a kind of Donald Rumsfeld/Jack Nicholson in A Few Good Men, and Captain Kirk as the patsy sent to do his dirty work. And even for me, with only a cursory knowledge of Trek lore, it was obvious who Harrison really was, and also the role that Alice Eve's scientists and Scotty were going to play. I guess that's kind of my problem with the whole film. I loved the emotional stakes - and the contrast between Spock and Kirk/Uhura in how they deal with emotional stress. But the actual plot, while not entirely predictable in its details, was basically obvious once you figured out who Harrison was. And knowing the antecedents of his character meant that you knew basically how the final scenes were going to play out, and how everyone was going to live happily ever after to leave this film at, pretty much, the start of the old TV series - on a five year mission to go exploring. One other quibble - there's a wholly unnecessary and rather juvenile plot device that allows us to see Alice Eve in her underwear. That was unworthy of this film. STAR TREK: INTO THE DARKNESS is rated PG-13 in the USA and has a running time of 132 minutes. STAR TREK: INTO THE DARKNESS is on release in the UK, Australia, Austria, Germany, Ireland, New Zealand, Switzerland, Bulgaria, Hong Kong, India, Mexico, Norway, Sweden, Taiwan and Thailand. It opens next weekend in Egypt, Bosnia, Chile, Croatia, Hungary, Kuwait, Lebanon, Malaysia, Peru, the Philippines, Russia, Serbia, Singapore, Slovenia, the Ukraine, the UAE, Canada, Colombia, Cyprus, Estonia, Iceland, Indonesia, Latvia, Lithuania, Mexico, Panama, Romania, the USA and Vietnam. It opens on May 23rd in Cambodia and Macedonia; on May 30th in South Korea; on May 31st in Poland; on June 5th in Belgium and Finland; on June 6th in Denmark, the Netherlands and Portugal; on June 7th in Turkey; on June 12th in France, the Czech Republic, Israel and Italy; on June 14th in Brazil and South Africa; on July 5th in Spain; on July 11th in Greece; on July 19th in Venezuela; on August 22nd in Argentina and on August 23rd in Japan.